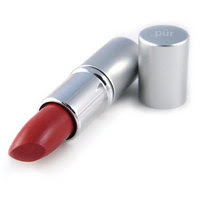 Our top pick for natural mineral lipstick is PurMinerals Mineral Shea Butter Lipstick. We love these lipsticks because their sheer with buildable coverage, glide on easily and stay on. They come in 25 amazing lipstick colors, are toxic free and not tested on animals. Their infused with (good for you) ingredients like micronized minerals, shea butter, vitamin E, jojoba oil, lycopene extract, aloe vera and a secret blend of essential vitamins to give your lips a luscious treat with each application. They will leave your lips feeling soft, supple and fully hydrated. You can learn more at http://www.purminerals.com/.